Susan McLellan Plaisted is a commonwealth speaker for the following programs. One free presentation per calendar year is available to eligible organizations. Eligible organizations include nonprofit organizations, educational institutions and local, state and national governmental agencies that are planning public programs in Pennsylvania. Apply to the Council for programs for your organization: Information and a link to the Humanities Council site is found on this page below the presentations list. 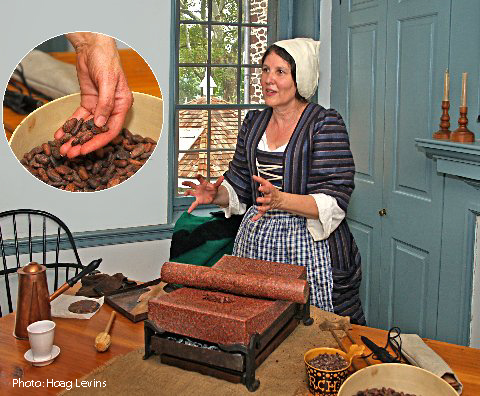 The aroma of chocolate wafts in the air as this presentation connects the cultural use of chocolate from Meso-America to Europe and back to colonial America and Pennsylvania. Learn the basics of cacao cultivation, harvesting and fermentation. Examine Mayan, Aztec and European artifacts to compare and contrast chocolate in different societies and explore the place of chocolate in Pennsylvania. Participants have the opportunity to grate "chocolate cakes" and make and sample a historic chocolate beverage. The humanities are about sharing powerful stories and exploring big ideas. Commonwealth Speakers is one way that PHC reaches out to all Pennsylvanians to share our excitement about this learning experience. Bring your community together to discover something new about history, the arts and the world around you. Commonwealth Speakers is a great opportunity to share conversations and ideas with scholars, artists and storytellers and to raise awareness of your organization as a center for learning in your region. Our Speakers are experts from a variety of backgrounds—arts and museum educators, folk artists, dancers, musicians, scholars—who offer presentations on a wide range of popular topics. The 2012-13 Commonwealth Speakers line-up features more than 50 Speakers—selected for their demonstrated expertise and their ability to engage an audience. While Speaker presentations are incredibly diverse in terms of topic and format, they all share a common feature—the opportunity for audiences to come together and learn from each other. For more information, visit the Council's website. Susan McLellan Plaisted's PowerPoint presentation will discuss the living quarters and implements of a Lenape village to explore the foods and food technologies of the Lenape within the context of their culture. Plaisted will intertwine ethnobotanical research, European narratives and archaeological information with images of hominy processing, drying racks and the roasting of fish and fowl. Reproductions, artifacts and pelts also will be on hand. This Pennsylvania Humanities Council presentation given from 2008-2011 is no longer available via the Commonwealth Speaker program BUT IS AVAILABLE directly from Susan. Please contact Susan for more information if you are interested.